A. The rounding option can be found within your Company setup. Within TimePilot Central go to Setup > Company Setup > Edit Company. Click the tab labeled "Rounding" to make adjustments. Q. While setting up a new employee, I didn’t capture his iButton number, and when I downloaded the transactions from our Extreme clock this morning it said I had three orphan records. I now have assigned the profile to the iButton he used yesterday but do not know how to capture the orphan records. Open the Extreme Data Manager on your PC. Within the Extreme Data Manager, right-click the clock you want to retrieve the previous transactions from and go to Station Properties > Advanced. Insert your USB drive in your clock and tap the management button on the IN probe. Once that operation is complete you can bring the USB drive to your computer and import the transactions as you normally would. The orphan transactions will be discarded. Q. How long will the battery in my Tap+ clock last after it’s unplugged from the USB cable? A. That depends, of course, on how often it’s used, but our testing indicates it should last about a year before it needs to be recharged. However, you'll probably never reach that point: The battery automatically recharges while you download your clock-ins and clock-outs into the TimePilot database on your computer. Frozen in Time, Part 1: Ever wonder why the time displayed on all of Apple's ads for iPhones and iPads is 9:41? It's because Apple CEO Steve Jobs unveiled the iPhone at a Jan. 9, 2007, conference at 9:41 a.m. Apple's marketing experts wanted to have the time shown on the onstage photo of the iPhone to be as close as possible to the actual time at the moment it was announced. They calculated that the unveiling would be roughly 40 minutes into Jobs' speech, which started at 9 a.m. They've kept 9:41 as an homage to Jobs' announcement. Frozen in Time, Part 2: Why do most ads for analog watches (the kind with a minute hand and an hour hand) show the time at 10:10? There are two main reasons: first, the hands don't block the watchmaker's logo, which is usually at 12 o'clock; and second, the hands form a "smile," which subliminally makes the watch more attractive to the viewer (and increases the chances of a purchase). TimePilot Q&A: Rounding and orphan transactions. TimePilot Best Practices: 7 top articles from past newsletters. 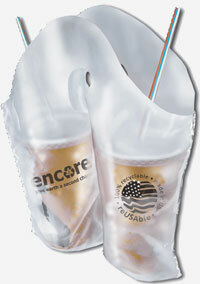 Cool Stuff: Beverage Cup Carrier Bag. Multiple companies in the TimePilot software? Why? Let's say you're at the local fast-foot restaurant, picking up lunch for you and a co-worker. You've got two drinks, two bags and there aren't any cardboard drink carriers. Then you see the solution. It's a simple plastic bag with a handle, divided into two slots, each just the right size to securely hold a cup as large as 32 ounces.